Designated a wilderness in 2002, the James Peak wilderness is located south and west of the town of Nederland, not far from the tiny community of Rollinsville. Separated from the Indian Peaks wilderness by Rollins Pass, the James Peak wilderness contains the eastern flank of a ridge of rounded peaks, the highest of which is 13,294 James Peak. 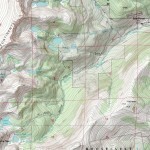 The wilderness boundary extends north to Rollins Pass, west to the top of the Continental Divide, and south nearly to Hwy 40. James Peak wilderness consists of 17,015 acres of high altitude peaks, alpine tundra, and over a dozen small alpine lakes and tarns nestled on the eastern edge of the Continental Divide above treeline. The wilderness contains lodgepole pine and spruce-fir forests, mainly on the northern end, and in drainages on the eastern perimeter. The western portion of the wilderness tops out at the top of a line of treeless peaks that march north-south forming the Continental Divide. Accessible nearly year round, James Peak is an easy area to explore due to it’s relatively small size. The wilderness receives heavy snow in the winter. For this reason, hikers enjoy the wilderness mainly in the summer months from July through September. 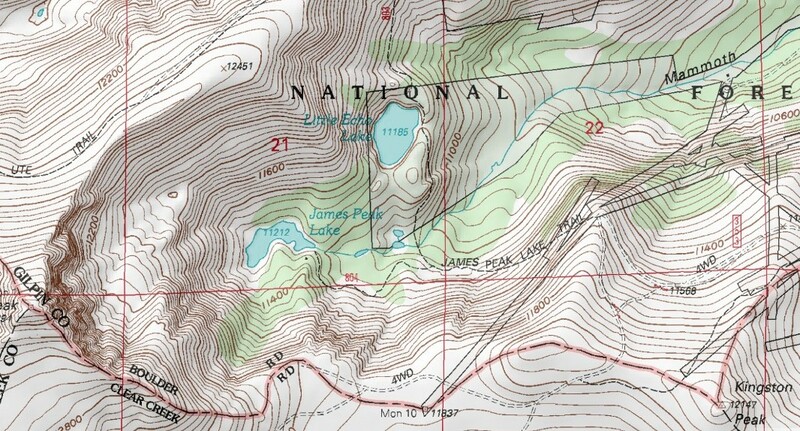 The northern end of the wilderness is accessed through Rollins Pass Rd / Tolland Rd. Another forest road, Mammoth Gulch Road (a 4WD road accessed via Tolland Rd.) veers to the south and gives access to the James Lake trail and points south. Heart Lake / Rogers Pass Lake – Hike to two lakes set on a bench beneath the Continental Divide. The South Boulder Creek trail begins at the East portal of the Moffat Tunnel. From the trailhead it climbs 4.2 miles to Heart and Rogers Pass lakes. The trail follows the forested South Boulder Creek drainage while crossing numerous creeks along the way. Wearing waterproof footwear is recommended. From Hwy 119, at Rollinsville, head west on Tolland Rd for eight miles to the Moffat Tunnel. A large parking lot at the East Portal of the Moffat Tunnel is your destination. The South Boulder Creek trail begins from the East Portal trailhead. 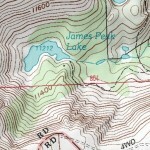 James Peak Lake Trail – A short downhill hike to James Lake, nestled at the bottom of 13,294 ft. high James Peak. The trail begins at the top of a ridge and rapidly descends a rocky trail to the lake. Views of high alpine peaks, James Lake, and stunted krummholz trees. From CO-119, turn left onto Cnty Rd 16, Tolland Rd and head west for 5 miles. Turn left onto Mammoth Gulch Rd., a rough 4WD road. After 3.5 miles, turn on National Forest Rd. 353 and continue for 3.3 miles to the James Peak Lake Trail. The trail head is marked with signage and is located on the edge of a treeless ridge.